We’ve had more than our share of mini laptops and no matter how many come out with the latest sparkly pink cover, blue keyboard or silver keys we know we’re not going to replace our trusty old one with a new one. After all, you don’t buy a car a few months after the last one because it’s got a new wheel arch design or different alloys, do you? Therefore it comes as no surprise that laptop manufacturers are looking at for a new craze in the market to keep their pockets full, and this time its eBook readers. Asus, once the leader in mini notebooks, after its successful EEE PC range is rumoured to be venturing into this electronic story book market by the end of 2009 or into 2010. Its main rival MSI is also looking at this market. However is this already oversaturated market big enough for laptop manufacturers too and does this mean in a few years time we’ll be inundated with these products? Or will the competition drive down prices for us, in the same way as MP3 music sales? We take a look and tell you exactly what you’ll be getting if the market continues to expand. 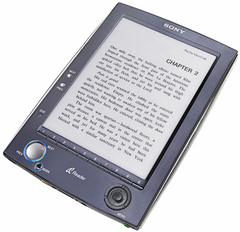 Earlier this month Sony announced it was going to stop using its proprietary ebook software in favour of the ePub open standard, which would give us cheaper books. It also means that we will have more choice as it the software is compatible with PCs and the iPhone. The announcement ruffled the feathers of Google, which already uses this software on it Kindle book reader and saw it as a main advantage over its Sony competitor (still with us?). Amazon founder Jeff Bezos has now said that his company will not rest its e-book hopes entirely on the Kindle, and would explore new formats. So with this is mind we’re hoping by next year that prices for both the devices and books will be considerably lower than they are now and perhaps we may even see a god old price war.